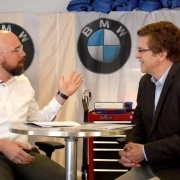 Jim: I’m here with Uwe Higgen the managing partner at BMW i Ventures. 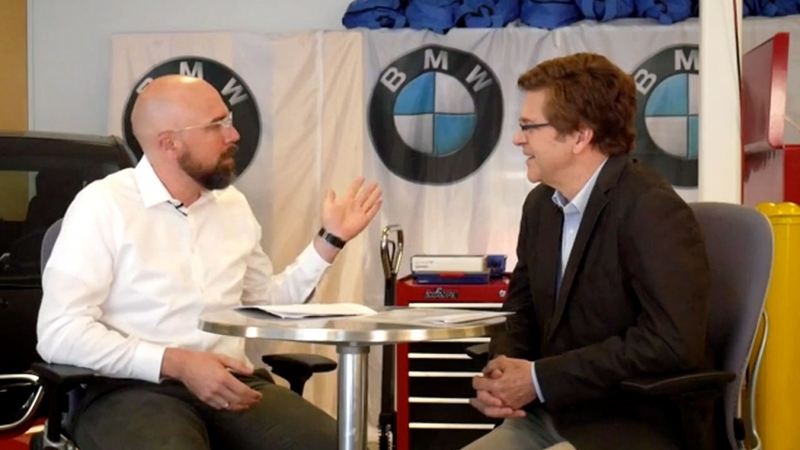 Uwe: Welcome Jim to the BMW Technology Office in Mountain View where we are working in many different disciplines on the future of mobility, the future of cars. Here in our garage you can see a little lineup with our autonomous 7 series, i3 and i8. Jim: I know that electrification is one of the key trends that you see in the area of cars and mobility. How is it informing your work? Uwe: Electrification is the next step in technology adoption around mobility – in order to be more sustainable, to have lower emissions. The overall thinking about electrification and mobility started 10-12 years ago. We knew that we needed to rethink the drive train and the way we build cars if we were going to have more sustainable vehicles. We are now seeing a lot of positive trends around battery technology. Batteries are getting more affordable, have greater power density and hence provide greater range. And of course the motor or the inverter in the electric vehicle (EV) is much more efficient already compared to an internal combustion engine. Jim: Power electronics are pretty critical to those EVs. GaN Systems does a lot of work with customers in the auto industry making a variety of devices such as board chargers (OBC), DC to DC converters, and the traction inverter in the electric motor itself as part of the drive train. With our GaN power semiconductors, these customers are able to make the power electronics ¼ the size , ¼ the weight, and more efficient than what is currently on the market. When you have things that are lighter in weight and smaller in size, the car goes further on the charge that you have on your battery. Uwe: And with all of these things made smaller, you can have more space for batteries for even greater range. Jim: The other area that’s really changing is in autonomous driving, AVs. Power semiconductors from GaN Systems play a role in some of the sensors and wireless charging for those vehicles. There’s a copious amount of data generated by AVs. Some of that data is used by computers in the car, and some is sent to data centers that also have to be concerned about power conversion and energy efficiency as this data demand increases. What do you see as some of the important trends around autonomous driving? Uwe: I see two phases to autonomy. One is increased safety with ADAS systems that adds a lot more intelligence to the vehicle with more sensors and computing power to better understand the surrounding environment. That is the first generation where we have to save lives and ‘de-risk’ the driving experience for our customer. The second phase of autonomy is about the human needs of convenience, accessibility, and productivity. We also need to pay attention to a big population out there that has had no access to instant mobility. Some people cannot walk; they need a wheelchair. Some people are blind. They have problems around fulfilling their need for individual mobility. I think the autonomous world will solve this in a great way. Jim: So as we move from the internal combustion engine (ICE) to electric vehicles to autonomous vehicles – we are seeing a huge increase in the number of semiconductors. An EV has twice the dollar content of semiconductors as ICE. An AV has twice that of an EV and four times that of ICE. That’s big growth in semiconductor content. Uwe: That’s right. It used to be that we develop algorithms to run on those semiconductors. Now we are using the rich sensor setup of an AV to get an understanding of the environment and let the machine learning algorithm train on their data and redeploy that learning, those ‘brains,’ to the vehicles. Much higher computational power and memory are required to run those brains in the vehicle to make driving safer and more convenient. This creates an interesting challenge for the auto industry to keep up with the consumer industry – around having the same )or really better) performance in the semiconductors in cars as you have with the phone in your pocket. Jim: It’s an interesting revolution going on in the automotive industry and power electronics with EVs and AVs. Uwe: I think the mobility problem can be solved in a very different way than it is today. And hopefully in a much more efficient and predictable way.